With just 11 weeks before the start of the holiday season, now is the time to get a jump start on this year’s corporate gifts to clients and employees. Gift giving is one the best ways to nurture business relationships and show your appreciation, but comes with a few challenges. From when to order, what to choose, what to spend and other decorum, we have put together these 5 tips to help you simplify the process and make it more meaningful for everyone. The holiday season is one of the busiest times of the year, so early fall is the perfect time to get started to avoid the rush. Not only do you need enough time to comfortably plan, research and choose your gifts, there are also production and printing times to consider. It’s always a good idea to call your printer and ask for turnaround estimates to ensure your gifts can arrive on time. Ultimately, the amount you spend on gifts is up to you, but there are a few things to think about. 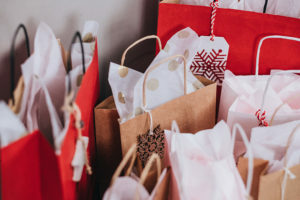 Some service providers and businesses have limits for the types of gifts they can receive, and some prohibit employees from receiving gifts altogether. Taking a moment to check with your clients directly will help you prevent a potentially awkward situation. One of the best rules of thumb is to always choose sentiment over spend. The goal for holiday gift-giving to clients and colleagues is to develop, maintain and nurture relationships by showing you care. Picking items that are personal, yet relevant and professional within your budget can be one of the most exciting parts of gift giving. Even small tokens, such as magnetic clips to display photos, cards and other mementos, are a great way to let others know you’re thinking of them. Don’t know where to begin? Mojo Print Solutions has a long list of options to fit every budget and every business relationship. From religious beliefs to personal values, keep in mind that everyone is different. Despite your best intentions, giving a wine or beer opener to someone who doesn’t drink or sending a holiday-themed gift to someone who does not celebrate Christmas can lead to a very uncomfortable moment. Sometimes, all you need to show your gratitude is a customized thank-you or New Year’s card with a thoughtful, handwritten message. We can give you a hand with everything from design to paper choice and printing. When checking your list of names, it’s important to include everyone. Whether you are giving individual gifts or a basket for sharing, make sure there is enough to go around. The kindest of gestures can turn negative if anyone is inadvertently left out or feels less appreciated. Addressing the card to the entire company or group of employees will help ensure inclusivity. This year, make the planning and choosing of corporate gifts as joyful and memorable as the giving. Mojo Print Solutions can help with everything you need from unique ideas and expert advice to printing and production. Call us at 509.459.6656 or email us at info@mojoprint.solutions today. It’s all About You! But These 3 Invitation Musts Will Help You Share It.